Pompeo Urges Unity Among Gulf Countries, Pressure Against Iran : The Two-Way Secretary of State Mike Pompeo is urging easing economic tensions with Qatar amid efforts by the U.S. to apply new sanctions against Iran. U.S. Secretary of State Mike Pompeo, seen during a news conference in Riyadh, Saudi Arabia, on Sunday, is urging easing economic sanctions against Qatar. Mike Pompeo, on his maiden trip as U.S. secretary of state, is using the three-day visit in the Middle East to garner international support to pressure Iran to modify its nuclear program. During a stop in Riyadh, Saudi Arabia on Sunday, Pompeo urged unity among the Gulf states — saying cooperation and easing of economic tensions with Qatar is "necessary." Egypt, United Arab Emirates and Saudi Arabia have halted trade with Qatar, accusing the natural gas-rich nation of aiding terrorism and maintaining close ties with Iran. The discord between the Gulf states has frustrated U.S. officials' attempts to weaken the influence of Iran in the region. "We've got a common challenge in Iran. I think they all recognize that," Pompeo said in remarks to reporters. "We're hopeful that they will in their own way figure out their dispute between them." Pompeo's arrived in Riyadh shortly after Iranian-backed Houthi rebels in Yemen launched a barrage of missiles into Saudi Arabia, killing at least one person. The attack is the latest sign that the raging civil war in Yemen continues to further threaten stability in the region. 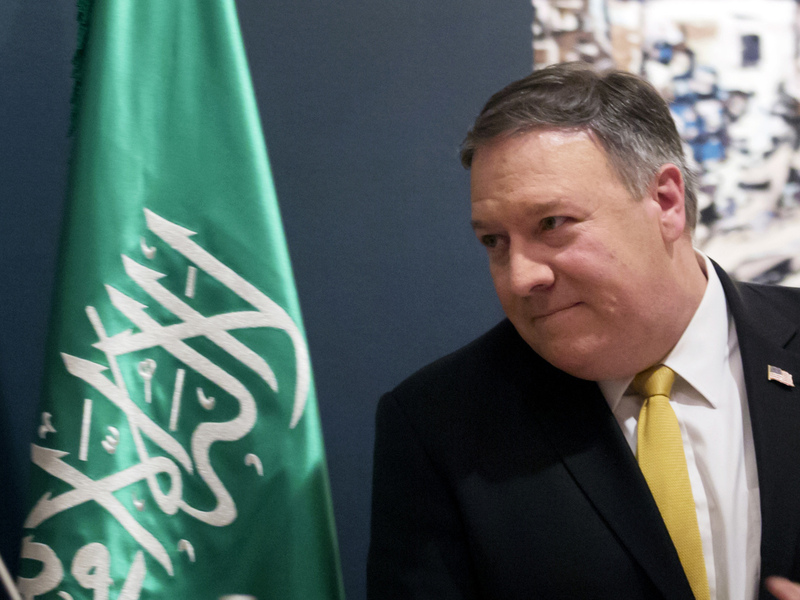 During the state visit, Pompeo also assured Saudi Arabia that the U.S. will follow through with President Trump's commitment to pull out of the 2015 Iran nuclear accord. The deal, reached under the Obama administration, essentially lifted economic sanctions on Iran in exchange for curbing its nuclear weapons program. Echoing Trump's sentiment that the foreign policy was a "bad deal," Pompeo said the accord has failed to moderate Iran's behavior. "In fact, Iran has only behaved worse since deal was approved," Pompeo said. Pompeo told NATO leaders in Brussels on Saturday that unless a substantial fix is made, the U.S. is unlikely to remain in the deal. And that decision, he said, would not impact expected talks between President Trump and North Korean leader Kim Jong Un. "I don't think Kim Jong Un is staring at the Iran deal and saying, 'Oh goodness, if they get out of that deal, I won't talk to the Americans anymore,' " Pompeo said. Pompeo is the highest ranking U.S. official to meet with the North Korean dictator. The two met in secret while Pompeo was still CIA director. He tells ABC News that he met Kim with "a clear mission" of irreversible denuclearization on the Korean Peninsula, and that there is still a lot to be done before that goal is reached. He says the administration is going into the scheduled talks with eyes wide open, "We're not going to take words. We're going to look for actions and deeds," he said. Trump is expected to make a decision on whether to stay in the Iran nuclear deal by May 12. Two days later, the U.S. embassy in Jerusalem is scheduled to open its doors. A move that, Pompeo said in his meeting with Israeli Prime Minister Benjamin Netanyahu reflects the "reality" of Jerusalem as the seat of Israel's government. President Trump's decision to relocate the embassy has not been without controversy. In joint remarks Netanyahu asserted his support for renewed sanctions against Iran. "Iran must be stopped. Its quest for nuclear bombs must be stopped. Its aggression must be stopped, and we're committed to stopping it together," he said.